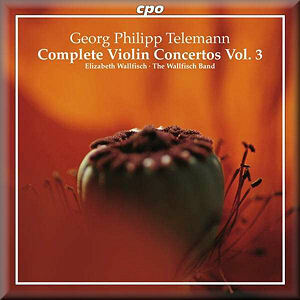 Over the years the German label CPO has released many recordings of music by Georg Philipp Telemann. Right now two projects are taking place simultaneously. The first is the recording of the complete wind concertos; recently the seventh and penultimate volume has been released. The project with the violin concertos goes a little more slowly: the first two volumes appeared in 2004 and 2006 respectively, whereas the third was released in 2010. I don't know how many will follow, but as this disc includes one of the eight concertos for two violins I assume we will see at least one further disc with the rest of the double concertos. At the moment of writing this review the fourth volume has been announced, including three further overtures with a solo part for the violin. That is all very good news for Telemann aficionados, and their number is growing. The time that he was considered a superficial hack are probably well behind us. The more parts of his oeuvre are discovered the more one is impressed by the quality of his compositions and the extent of his creativity. The present disc bears witness to that as it contains three pieces which are remarkable in various ways. The first two pieces are no solo concertos, but rather overtures. Telemann was the most prolific composer of overtures in Germany. The two specimens on this disc belong to a category of which he himself was the inventor. Overtures were mostly scored for an orchestra of strings and basso continuo, to which often two oboes and a bassoon were added. Telemann's overtures not only contain considerable variation in scoring, he also composed several with a solo part. The American scholar Steven Zohn has called them Ouverture en concert. The best-known of them are the Overture in a minor, with a solo part for recorder, and the Overture in D for viola da gamba, strings and bc. The two overtures on this disc belong to the same category. They are little-known, and the Overture in A was even considered incomplete. Only three movements had survived World War II. It is recorded here for the first time, on the basis of a reconstruction by Ian Payne. Unfortunately the liner-notes fail to give us any details about this reconstruction. It is assumed it was written in the late 1730s; the copy by an unknown scribe has 1741. The opening bars of the sixth movement are strongly reminiscent of the music by Jean-Philippe Rameau, and therefore it is quite possible that Telemann composed it shortly after his visit to Paris in 1737/38 where he may have attended performances of Rameau's opera Castor et Pollux. The violin part is notable for its virtuosity, which includes the use of double-stopping which is quite rare in Telemann's oeuvre. The first movement, the traditional 'ouverture', is followed by six movements which are mostly dances, although they are all called invention. In his liner-notes Christian Moritz-Bauer calls the third invention an operatic scene. It is divided into three large sections with the character indication 'grave', which are interspersed with very short passages with the indication 'vite'. The Overture in D has been preserved in the handwriting of Johann Georg Pisendel. He was the concertmaster of the court orchestra of Dresden, and the most brilliant violinist of his time in Germany. The solo part is more moderate in its technical requirements, but Pisendel must have found it attractive. One of its features is the diversity of styles, like the French character of the rondeau and the sarabande. The second menuet is one of the more demanding movements, with leaps of a tenth or more; here the basso continuo keeps silent. The contrast between the serious ouverture and the following badinage is notable. The caprice is interpreted here as reflecting the influence of folk music - the performance is called "gypsie style" in the booklet. The violins play largely legato, producing a sound which reminds me of the hurdy-gurdy. The double concerto is one of eight; five date from Telemann's years in Eisenach (1708-1712). The concerto played here was probably written around 1720, during his time in Frankfurt. Like most of his concertos it follows the model of the Corellian sonata da chiesa, with its sequence of four movements, rather than the Vivaldian concerto with three. In this case the idiom is also reminiscent of Corelli, as the first movement contains dissonants and the second is a fugue. The texture is unusual: the tutti violins are written in unison, whereas the viola is split into two. In the tutti passages the second solo violin creates a second part, resulting in a five-part texture. This refers to the kind of concertos which were written by Italian masters like Torelli and Albinoni. The influence of older Italian masters isn't that surprising. Telemann also composed a set of sonatas in the style of Corelli (the Sonates corellisantes). It once again shows the multi-faceted character of Telemann's oeuvre. This third disc is every inch as interesting as the previous volumes. On all three discs the soloist is the Australian violinist Elizabeth Wallfisch, who is one of the most prominent in the early music scene. She has made many recordings of often technically demanding repertoire, for instance the concertos of Locatelli. She delivers oustanding performances, and is partnered on an equal footing by the Wallfisch band. The booklet does not list the players in the ensemble, but I assume that most of them are from the Anglo-Saxon music scene. I assume that a performance with German players would have been different. In regard to articulation and in particular dynamic shading I could imagine a more differentiated approach. Even so I have greatly enjoyed this disc, and no collector of Telemann recordings will want to miss this one.